It's candy coal! 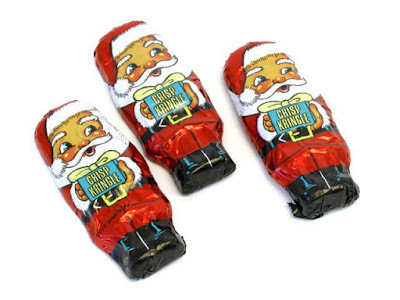 I always thought the idea of a bad kid being punished by a lump of coal in his stocking was funny. Candy coal is even better. It's kind of a “Dad Joke” but I don’t care. Christmas is prime time for Dad Jokes. The kid thinks he got coal. Big twist: It’s candy! Hilarity ensues. This stuff is comedy gold. How does it taste? It’s milk chocolate and crisped rice like a Nestle Crunch or a Hershey Krackel but maybe not quite that quality. Double Crisp Coal actually tastes a lot like the seasonal Crisp Kringle. When you think about it, Double Crisp Candy Coal isn’t punishment for a year of bad deeds but it isn’t quite ultimate reward material either. It’s more like candy purgatory. Mmmm. Purgatory.